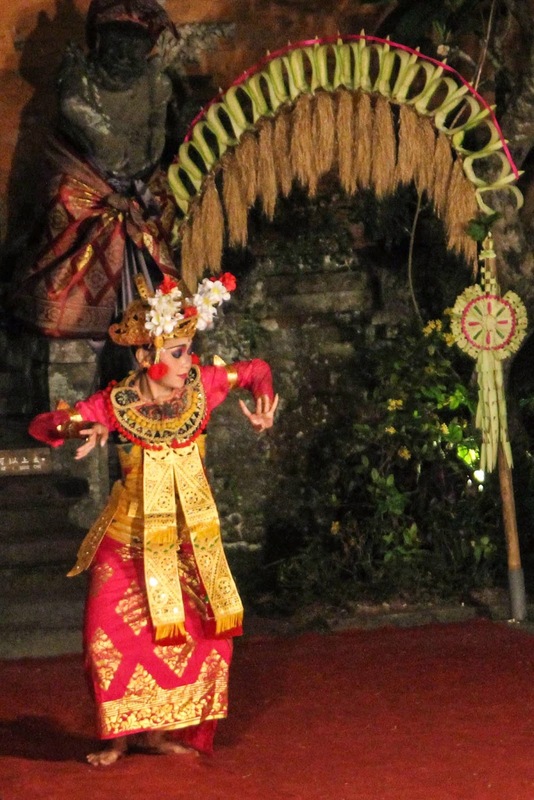 One of the most incredible parts of our stay in Ubud was getting the chance to see some of the traditional dances that the town is known for. 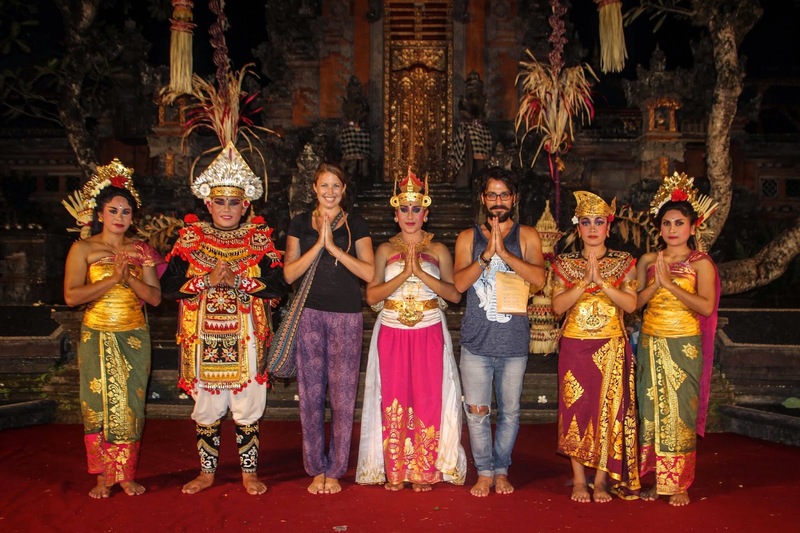 While definitely a tourist experience, we walked away with far more knowledge and appreciation of the traditional customs and stories of the people of Bali. 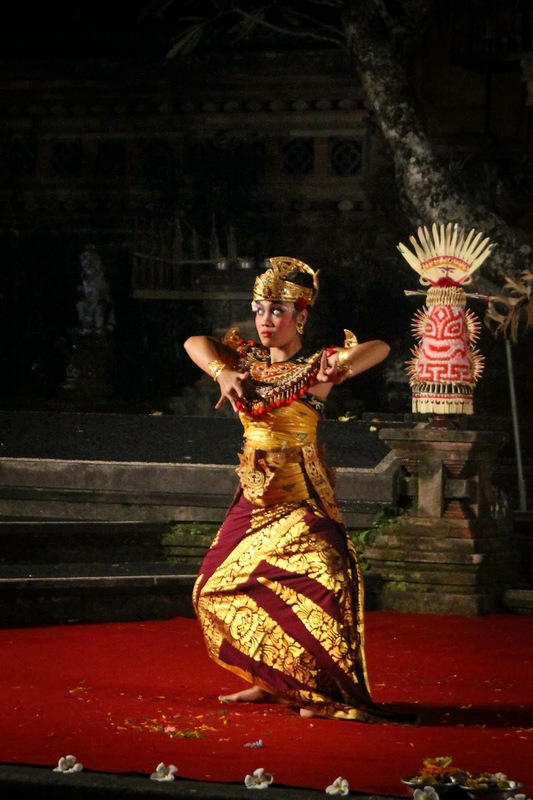 Our first experience with the traditional dances happened entirely by accident, as we were walking past the Water Temple on the way back from the town clinic. 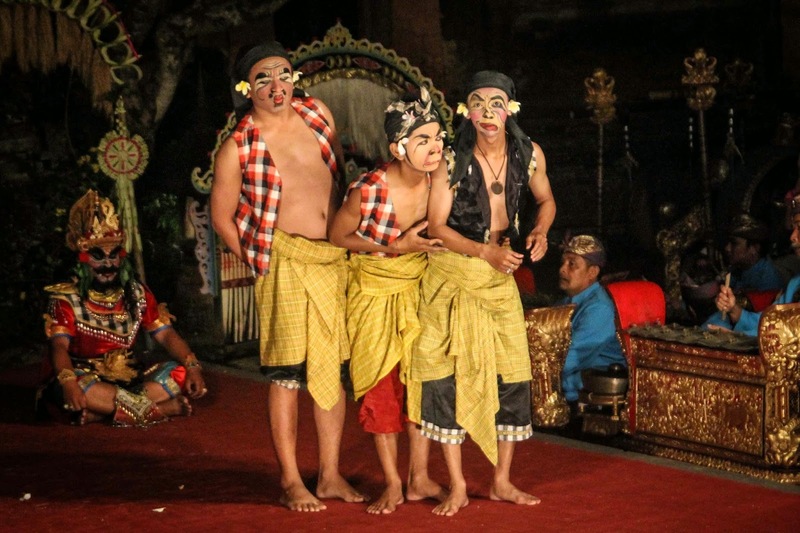 Men stood outside selling tickets to the performance, called 'Joged Dance' presented by Cepuk Wirasa. The show was just about to begin, so we took a chance and bought a ticket. 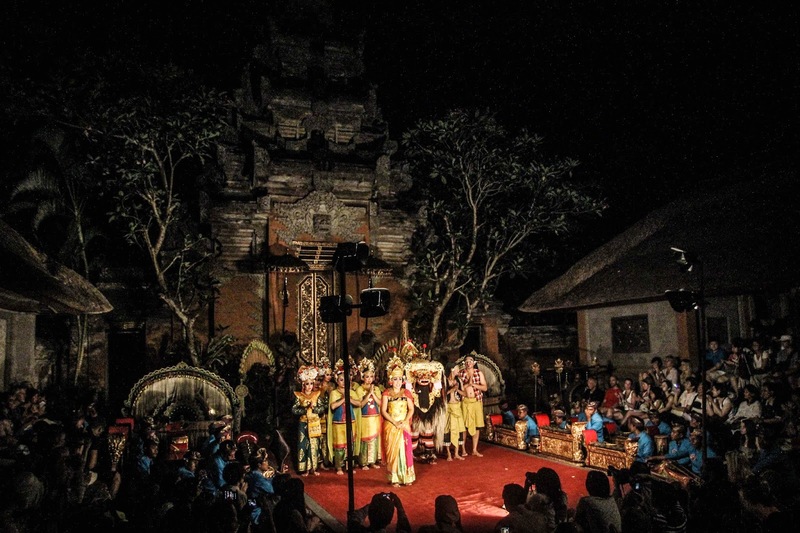 We were led inside to a small platform amongst the lotus blossoms where folding chairs had been set up in front of a small stage area in front of the temple. 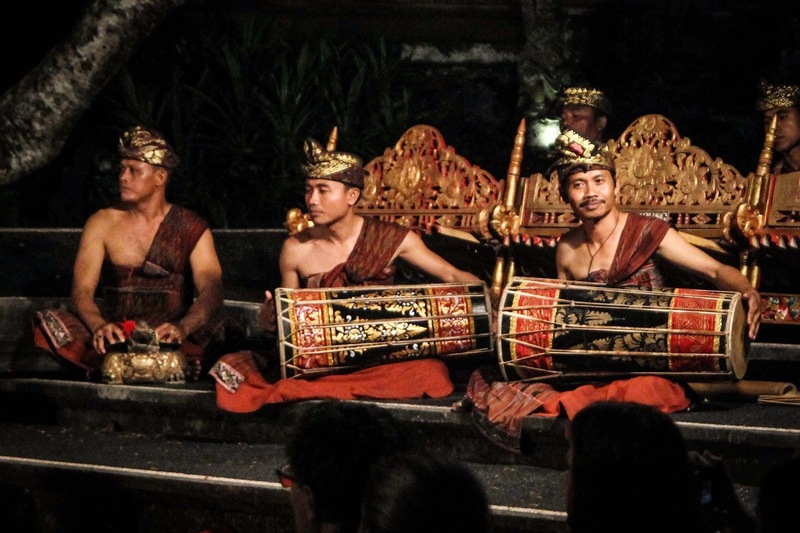 Not long after we were seated, the musicians began, with drums and xylophone-style hammers on metal, making light pinging sounds, and a couple of flute players. 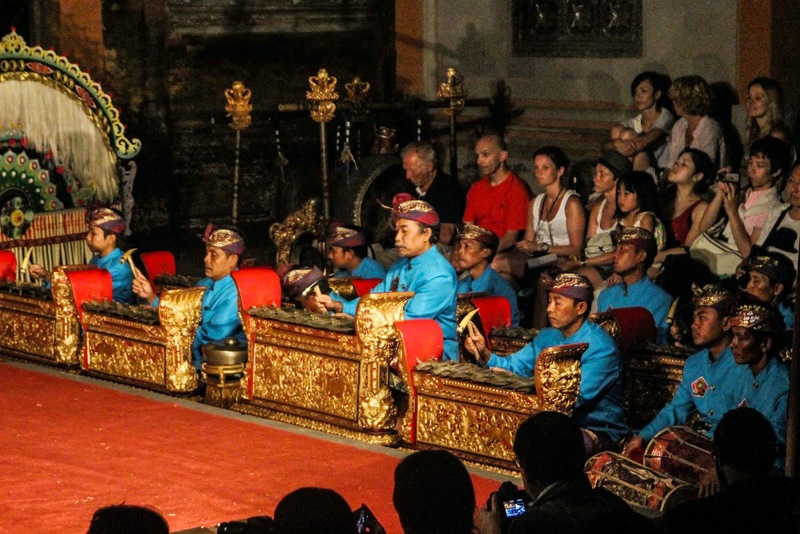 After the musicians had performed a song on their own, the dancing began. 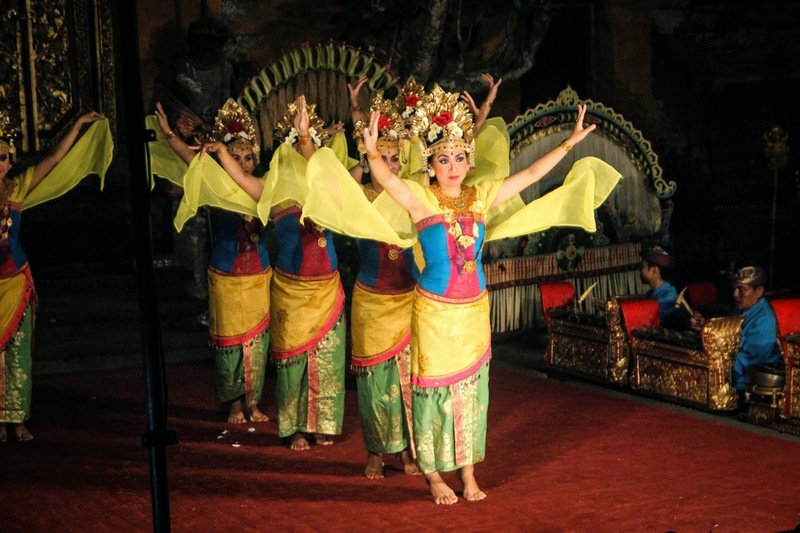 Performers emerged as solos or in groups of two for individual performances. 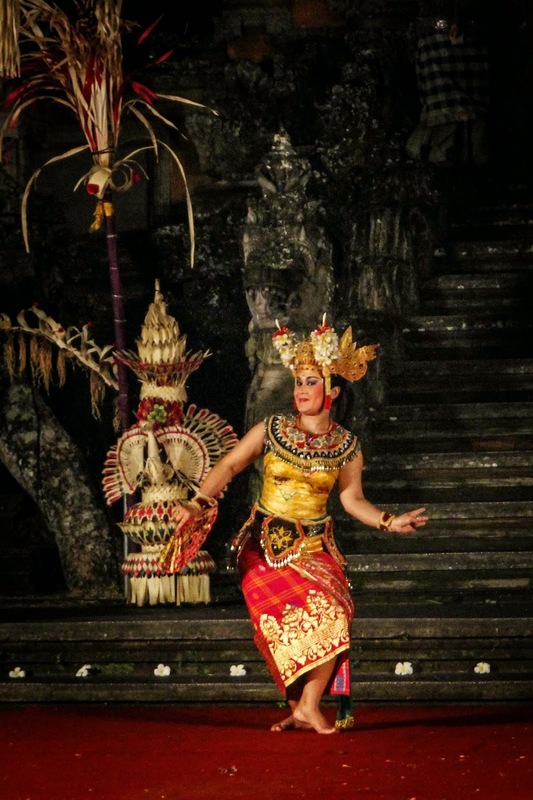 The first set was two pairs of women in an intricate performance involving detailed movements of fingers and eyes, a sort of isolationist style of dance that I could easily see reflected in modern styles. 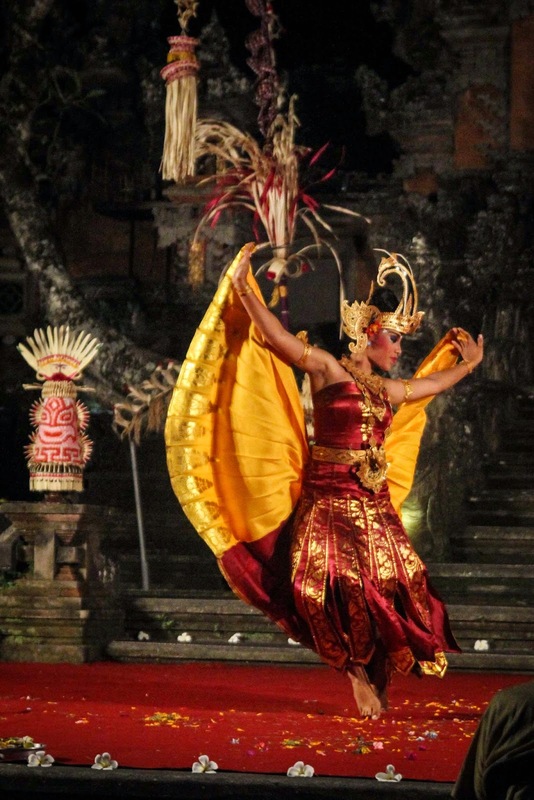 Two more pairs of women emerged with sort of a cape over their skirts, lifting it as they moved, giving them the appearances of birds with fluttering wings. A single man took the stage for another fantastic performance using similar isolationist movements as well as leaps from side to side. The show ended with a single woman who performed with a fan as a prop, later bringing two women up from the audience to dance with her. We got a quick photo with the performers after the show, and we were thrilled at our luck to catch such a fun performance on such a whim, after a day spent mostly hiding out and visiting the doctor. The other performance we saw also happened mostly by accident. 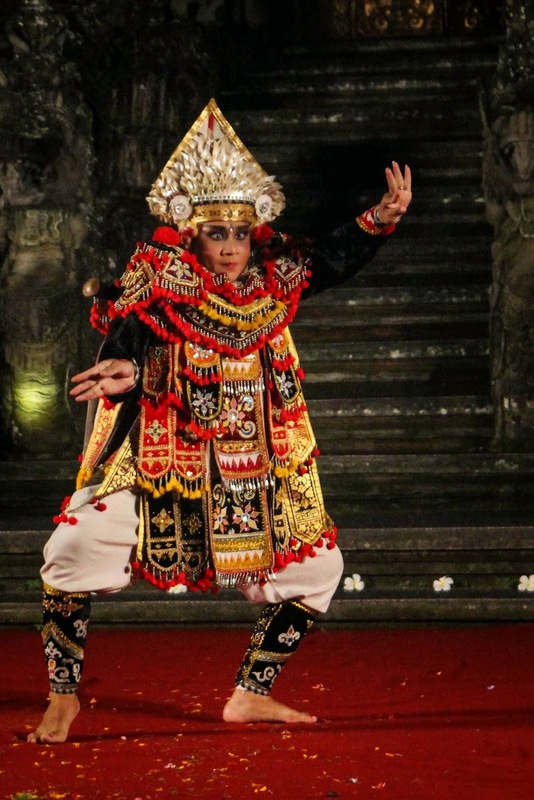 As we passed by the Ubud Palace later in the week, we noticed that a performance by the Panca Artha Troupe would be starting soon, and it promised an appearance by Barong! We immediately decided to stay, and I scouted out a place to sit on the trunk of a tree up in a raised planter while Joao retrieved ice cream for us so we wouldn't starve! Just as before, the small orchestra played a piece to start the show, and we noticed that an older man with a grey mustache and a golden hammer for his instruments was the clear lead in the musical group, with every other musician taking their queues from him. 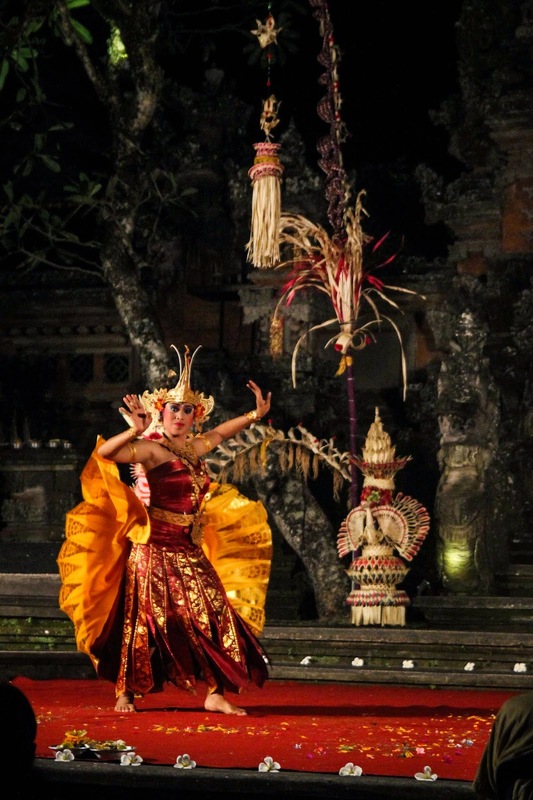 The very first performance of the night was one of my favorites, with three female dancers taking turns as solos or duets, making intricate sharp movements at incredible speeds, matching the amazing speed of the musicians. It was incredible to see the control they had over so many small areas of their body, moving almost completely independently of one another at once - the head and eyes, the arms and fingers, the hips and feet. 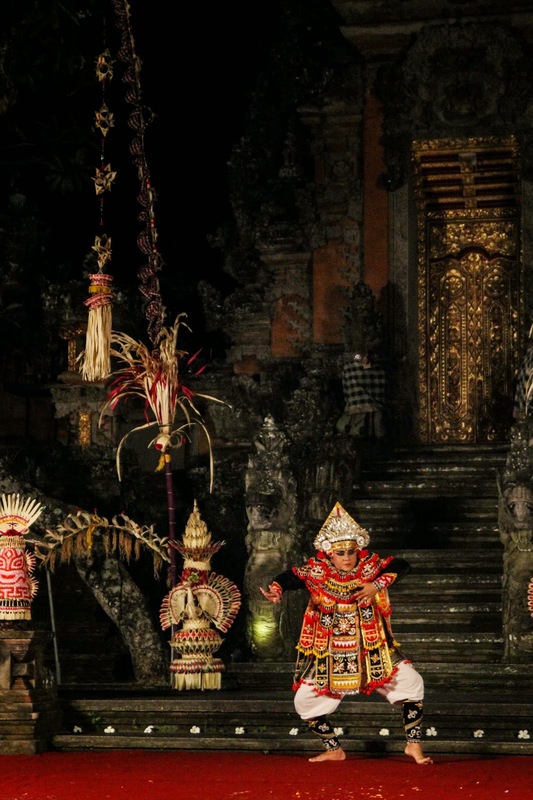 Next, we saw the first appearance of Barong. 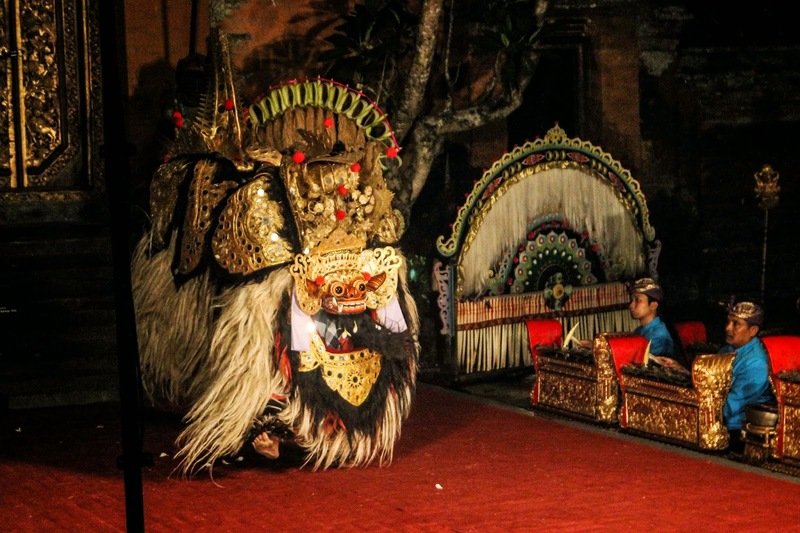 Barong is a powerful and benevolent guardian spirit in Balinese folklore, represented by a lion with a red face (which very closely resembles a Pekingese dog). 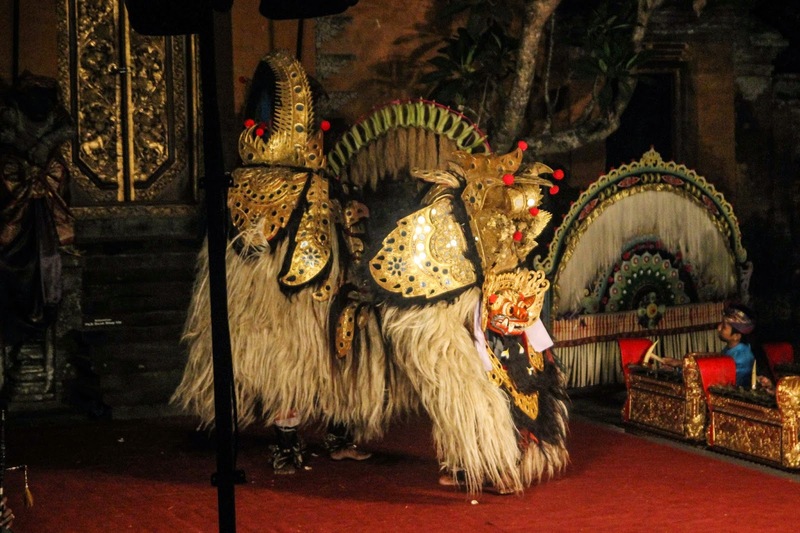 In the dance, two people wear the massive costume covered with fur. In this first appearance of Barong, we saw him playfully bouncing around - bobbing to the music - and getting teased by a monkey eating a banana. 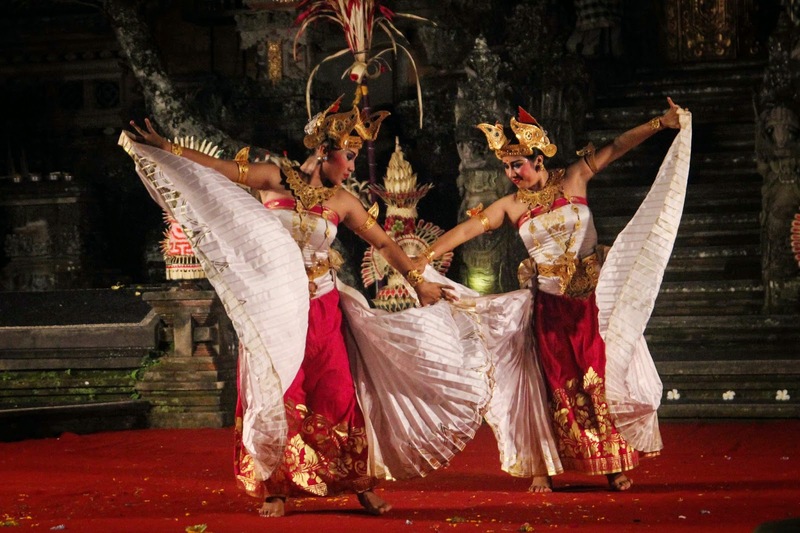 Next, there was a longer storyline with multiple scenes, each with many dancers in incredible costumes. 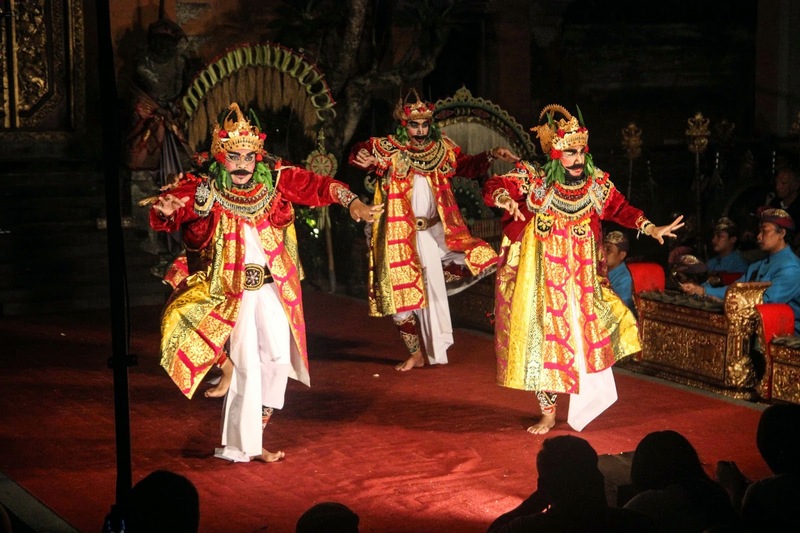 The story was taken from the Hindu epic Mahabharata, which tells of two giant brothers who were kings: Sunda and Upasunda. They had been given the power never to be harmed by any weapon, and they planned to conquer paradise, the home of gods and goddesses. 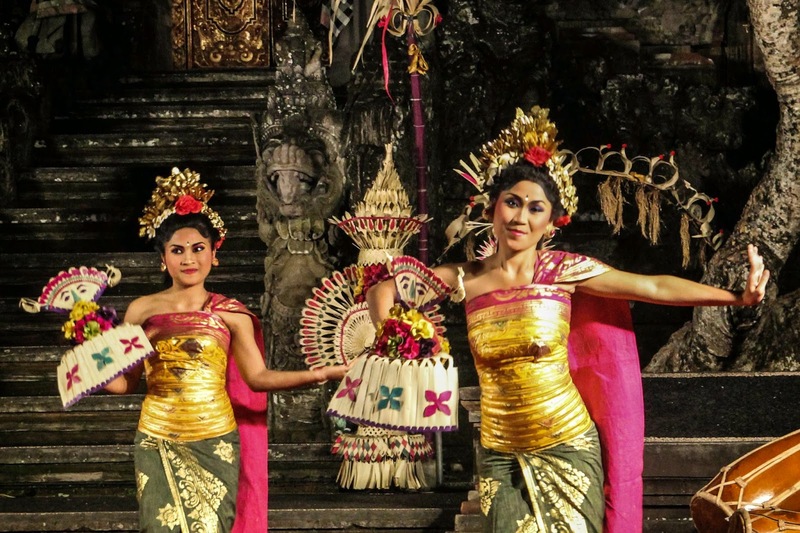 The king of the gods, Indra, decides to send the beautiful goddess Niatama and her nymphs Bidadaris to seduce the two giants. 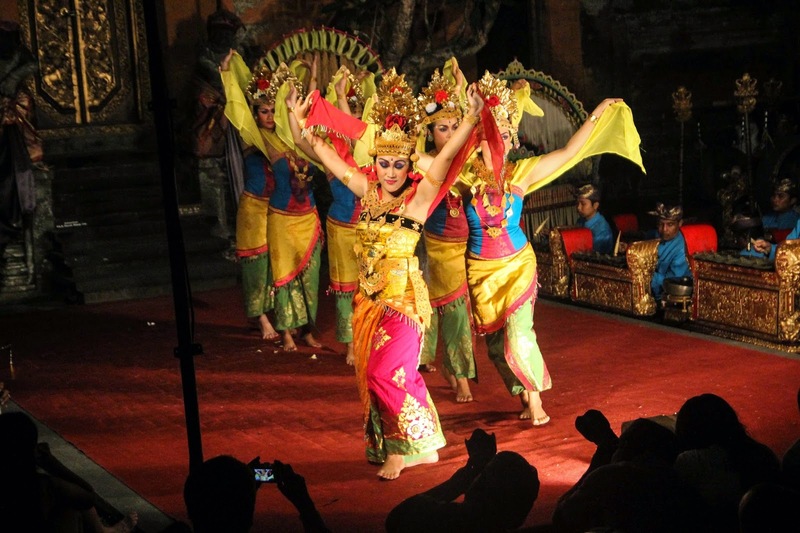 The Bidadaris successfully seduce the giants' people, but Niatama succeeds in making the two giants fall madly in love for her. Out of their desire, the giants battle each other. 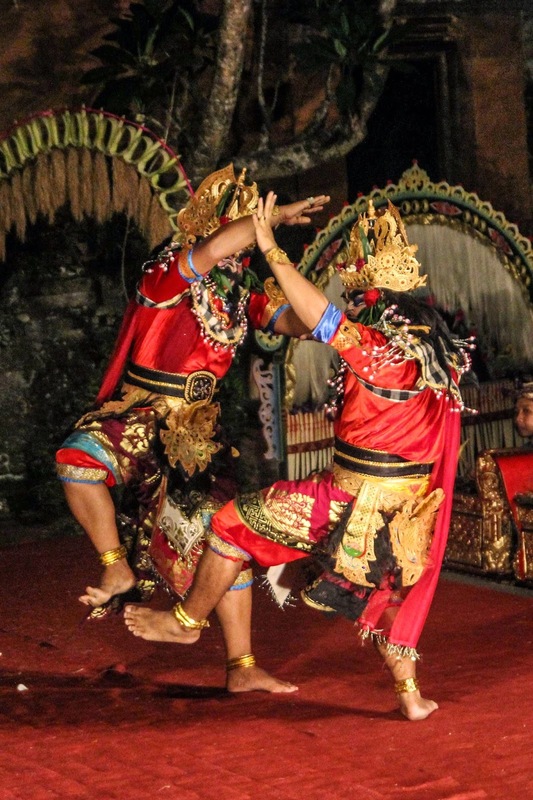 This portion of the dance was incredibly entertaining - showing the male dancers' amazing athleticism as they displayed the power of the giants in battle. The battle ended not with defeat but in exhaustion. Once the brothers are released from Niatama's spell, they cancel their plans to conquer heaven. 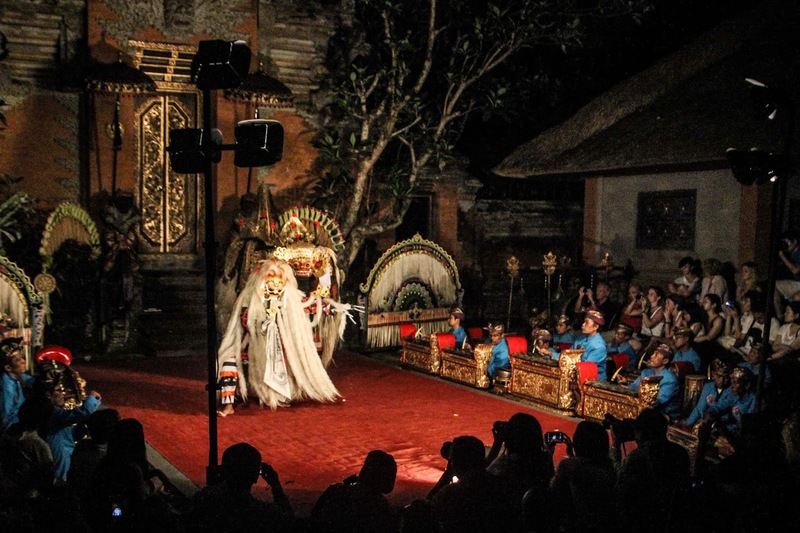 Finally, we were shown the rest of the traditional story of Barong. 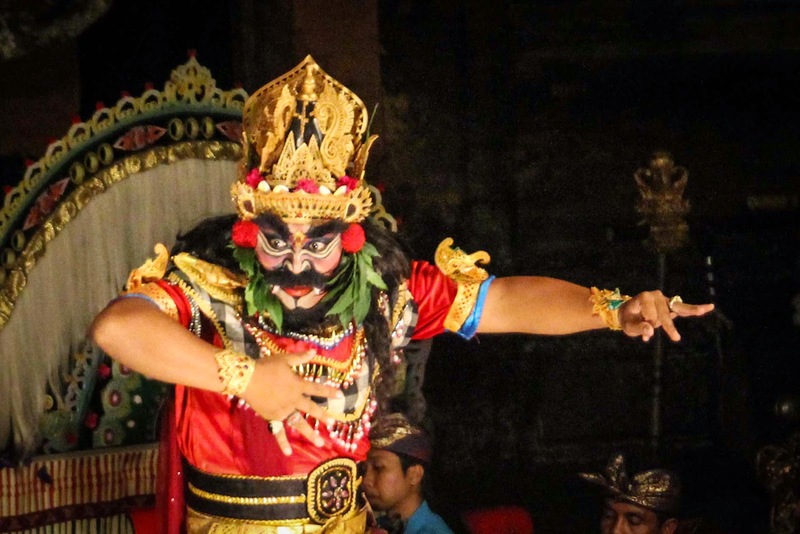 His enemy, a demon queen of black magic named Rangda - who is said to represent a past queen of Indonesia - made an appearance. 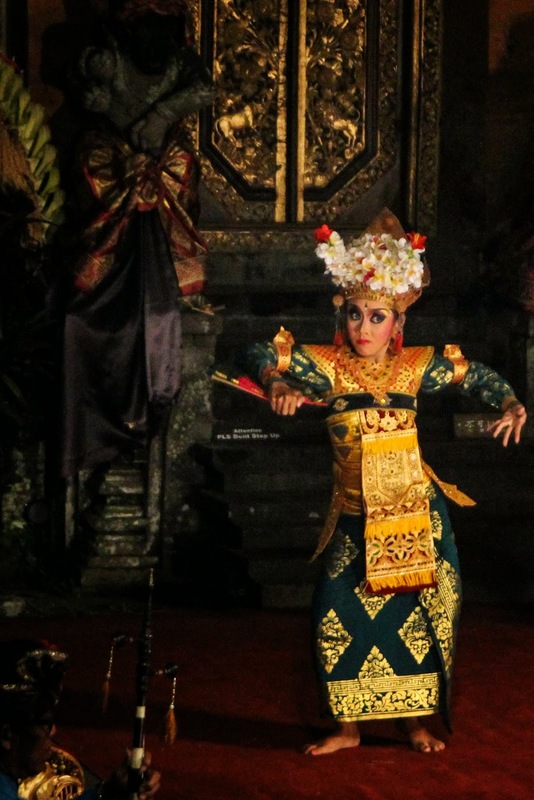 Rangda casts a black magic spell on a set of soldiers, who in their trance began to turn their weapons on themselves. 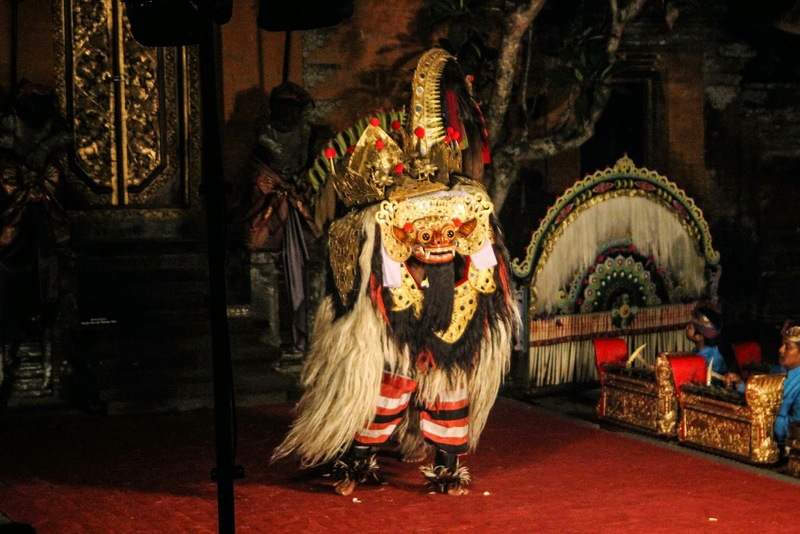 Barong then goes to battle with Rangda, defeating her and restoring celestial order. Finally, the dancers came out to take their bows. 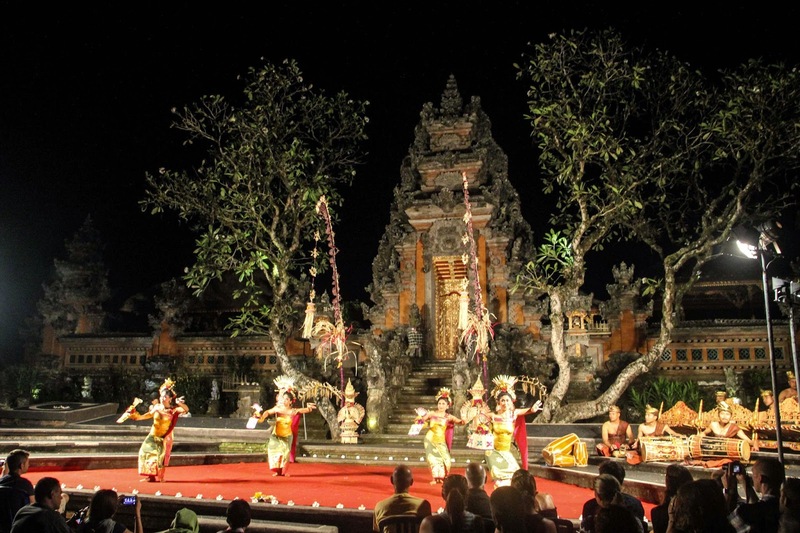 While the dance performances were clearly put on for the tourists, they were still representative of traditional Balinese stories and customs. 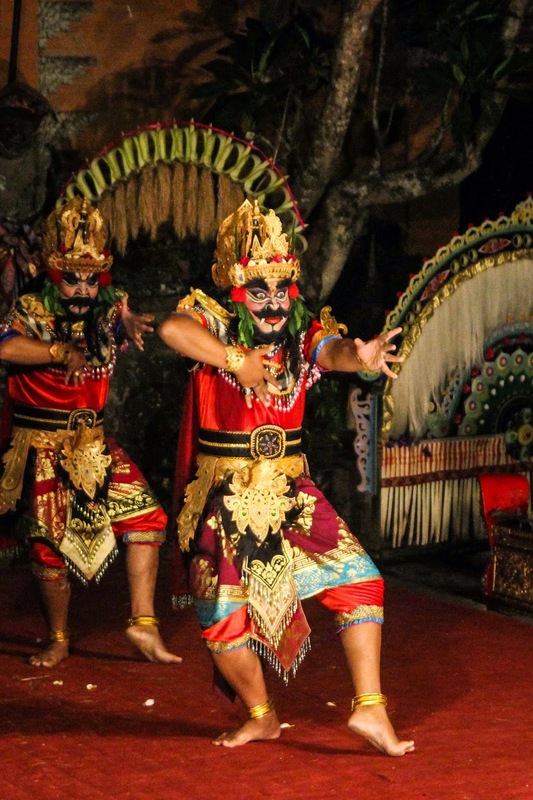 We loved the opportunity to learn more about the folklore and see the skill with which the dancers and musicians performed, and it was an incredibly entertaining way to spend an evening. 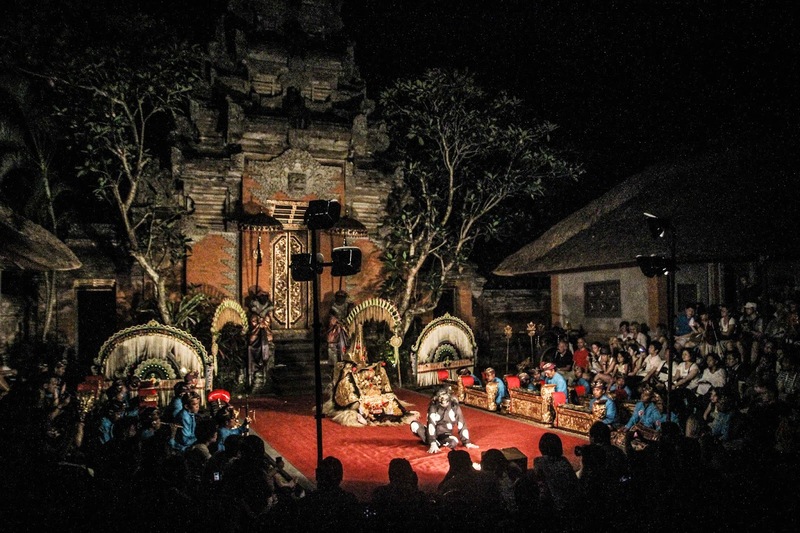 I highly recommend taking the opportunity to see a show or two for yourself if you ever happen to make it to Ubud!